Naoki Miyashita began developing e-Pedal in 2012 as a way to improve throttle control in performance cars. YOKOHAMA, Japan — One of Nissan's newest technologies, the go-cartlike e-Pedal, is pitched as an ecofeature in the company's greenest car, the second-generation Leaf electric vehicle. But e-Pedal, which turns the car's gas pedal into a combined accelerator-brake, actually began life as a performance-enhancing technology prototyped for sportier driving in the Maxima sedan. And it shows. Even in the mild-mannered Leaf, e-Pedal turns the car into a wheel- squealing cornering artist. That wasn't the original goal, but it is a pleasantly surprising bonus. "It's great for performance, not just eco-energy savings," said Naoki Miyashita, the engineer who developed e-Pedal. "One of the Leaf's new characteristics is fun and dynamic driving." E-Pedal debuted in the current-generation Leaf when the flagship EV was redesigned last fall. It allows convenient one-pedal driving. Push down on the pedal, and the car speeds up. Lift off, and it slows — even to a complete stop, and even on hills. Nissan says e-Pedal can cover 90 per cent of a driver's needs, alleviating the stress of pivoting your foot between brake and accelerator. That will serve drivers in stop-and-go traffic, but it also will boost the EV's battery because e-Pedal initially slows the vehicle through the grip of its regeneration brakes, not the friction ones. But the big surprise is the spirited handling it delivers around curves. On a recent test drive at a racing circuit near Mount Fuji, the Leaf squealed through the course with pronounced traction and assuredness, even though the car is hardly intended to be a speed demon. The technology makes it easier for the driver to negotiate turns. First, the car's computer adjusts the braking. Drivers don't need to fuss with switching their feet between the brake and gas. "It's very intuitive," Miyashita said in an interview at Nissan Motor Co.'s global headquarters. Amplifying the effect is active trace control — a kind of vehicle dynamic control system already introduced on such vehicles as the Rogue crossover and Infiniti Q70 sedan. Finally, the Leaf gets an electric brake booster system for hard-braking scenarios, to automatically kick in the friction brakes on all four wheels when needed. Miyashita said he began developing the system in 2012 as a way to improve throttle control in performance cars. A fan of driving the twisting roads of Japan's mountainous interior, he knew that keeping proper throttle control through a challenging curve wasn't always easy. He began working up a prototype in the Maxima sedan as a way to improve driving performance in traditional gasoline vehicles with automatic transmissions. He soon learned that another team was looking at a one-pedal control setup for EVs, but as a way to improve electric motor control — not for handling or drivability. Miyashita combined their efforts, and e-Pedal was born. So far, e-Pedal is used only in the Leaf. But Nissan is looking to use it in other electric vehicles, Miyashita said, declining to give details about when or which nameplates. Technically, the setup could be paired with internal combustion engines, Miyashita said. But Nissan has no plans for that because it is more difficult to integrate with the engine braking. 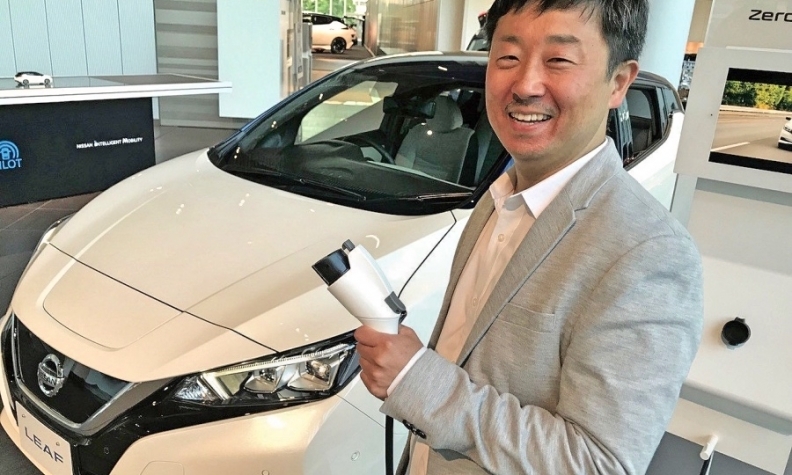 "The technology," Miyashita said, "is better suited to EVs."